This image from NASA’s Solar Dynamics Observatory on Mar. 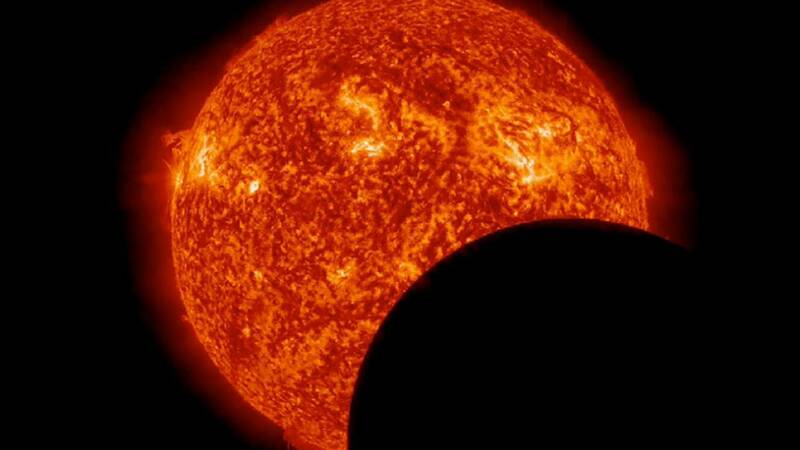 11, 2013, at 8:00 a.m. EDT, shows the moon crossing in front of the sun. Credit: NASA/SDO. PASADENA, CA; January 15, 2017 – PBS President and CEO Paula A. Kerger announced today at the Television Critics Association Winter Press Tour a new program from PBS’ award-winning science series NOVA, produced by WGBH Boston. On Monday August 21, 2017, America’s eyes will be glued to the skies as the mainland United States experiences the first total solar eclipse since 1979. NOVA will capture the spectacular event in a special presentation to air hours after it takes place. This extraordinary cosmic spectacle will pass through 13 states, and everyone in the continental U.S. will have the opportunity to see at least a partial eclipse, making it the most widely viewable eclipse of all time. Commencing at 10:15 a.m. PDT (1:15 p.m. EDT), a lunar shadow 73 miles wide will take one hour and 33 minutes to travel from Oregon on the west coast to South Carolina on the east, allowing continuous observation for 90 minutes. NOVA’s fastest turnaround film to date, “Solar Eclipse”(w.t.) will be the ultimate companion to this spectacular celestial event. NOVA will follow teams working on the forefront of solar science and solar storm detection, use immersive CGI animation to reveal the sun’s secret mechanisms and integrate stunning sequences of the eclipse itself — including scenes filmed at iconic locations along the path of the eclipse — user-generated content, NASA footage and more. In conjunction with the broadcast, NOVA will engage PBS stations nationwide to host eclipse watching parties and other events. PBS and NOVA’s digital teams will engage audiences online with a cross-country Facebook Live event highlighting real-time footage of the solar eclipse and the people and communities experiencing it. Additionally, NOVA will produce a web video chronicling the excitement surrounding the event. Additional social media efforts will involve educational components, outreach to schools and other activities to be solidified closer to the event. NOVA “Solar Eclipse” (w.t.) will be available to stream the morning after broadcast on all station-branded PBS platforms, including PBS.org and PBS apps for iOS, Android, Roku, Apple TV, Amazon Fire TV and Chromecast. NOVA “Solar Eclipse” (w.t.) is produced for PBS by WGBH Boston. Senior executive producer for NOVA is Paula S. Apsell. National corporate funding for NOVA is provided by Cancer Treatment Centers of America. Major funding for NOVA is provided by the David H. Koch Fund for Science, the Corporation for Public Broadcasting and public television viewers. Now in its 44th season, NOVA is the most-watched primetime science series on American television, reaching an average of five million viewers weekly. The series remains committed to producing in-depth science programming in the form of hour-long (and occasionally longer) documentaries, from the latest breakthroughs in technology to the deepest mysteries of the natural world. NOVA is a production of WGBH Boston. NOVA airs Wednesdays at 9pm ET/PT on WGBH Boston and most PBS stations. The Director of the WGBH Science Unit and Senior Executive Producer of NOVA is Paula S. Apsell. PBS, with nearly 350 member stations, offers all Americans the opportunity to explore new ideas and new worlds through television and online content. Each month, PBS reaches nearly 100 million people through television and nearly 33 million people online, inviting them to experience the worlds of science, history, nature and public affairs; to hear diverse viewpoints; and to take front row seats to world-class drama and performances. PBS’ broad array of programs has been consistently honored by the industry’s most coveted award competitions. Teachers of children from pre-K through 12th grade turn to PBS for digital content and services that help bring classroom lessons to life. PBS’ premier children’s TV programming and its website, pbskids.org, are parents’ and teachers’ most trusted partners in inspiring and nurturing curiosity and love of learning in children. More information about PBS is available at www.pbs.org, one of the leading dot-org websites on the Internet, or by following Twitter, Facebook or through our apps for mobile devices. Specific program information and updates for press are available at pbs.org/pressroom or by following PBS PressRoom on Twitter. WGBH Boston is America’s pre-eminent public broadcaster and the largest producer of PBS content for TV and the web, including Frontline, Nova, American Experience, Masterpiece, Antiques Roadshow, Arthur, Curious George and more than a dozen other primetime, lifestyle, and children’s series. WGBH also is a major supplier of programming for public radio, and oversees Public Radio International (PRI). As a leader in educational multimedia for the classroom, WGBH supplies content to PBS LearningMedia, a national broadband service for teachers and students. WGBH also is a pioneer in technologies and services that make media accessible to those with hearing or visual impairments. WGBH has been recognized with hundreds of honors. More info at www.wgbh.org.